The American band Aska started in 1990 and even if their last album was released in 2007 they played this year at the Keep It True festival, so more then one reason to sent over a few questions to George Call who is also the singer of Omen. 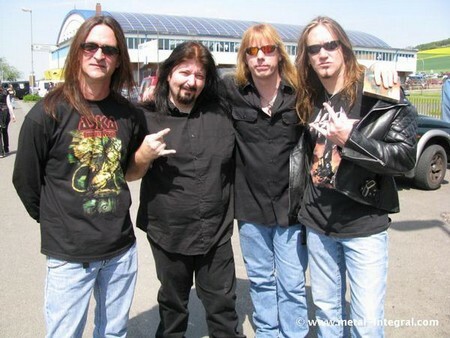 News: Omen are confirmed for Headbangers Open Air 2010: Are you working on a new CD? Hi Umberto! Omen is indeed working on a new CD. We took a break from working on it while the band went to South America for two months. We plan to pick up where we left off on it before we head to Europe for the Sword Brothers Festival and a string of dates in Greece this September now that everybody's back and then hope to have it completed before the end of the year for release in early 2010. Congratulations for Aska at Rocklahoma....News to tell about a new tour in Europe or a new CD? Thanks brother. Rocklahoma was a blast and this was the first time in three years that they included the more traditional metal acts like Metal Church, Saxon, Lizzy Borden, Icon, Anthrax, Aska and such at the show. We couldn't have had a better time, if we'd blueprinted it. As for Europe, we are definitely off to Europe next year. Aska will be doing two of the three dates at Headbangers Open Air and we'll be doing Sword Brothers as well, so look for us there. Funny thing is, I'll be playing every day of HOA, because I have the two dates with Aska and another with Omen - both in the same year. It's gonna be fun! As for the new Aska CD... It's in the works and nearly complete. We hope to have it out before the end of the year or early next year. A lot of people know you for Omen....Explain your beginnings with your band Aska! Aska was started by myself, my brother and school friends I grew up with after a bunch of us relocated to Texas to pursue our musical ambitions and aspirations. My brother and school friends scooted off to other things, but my bass player, Keith Knight, and I forged ahead and turned the band into something quite special. True metal has long been underground in the USA and us starting a true metal band in the midst of the Seattle grunge movement maybe wasn't the best thing at the time, but it was honest, we weren't chasing bandwagons, people saw that, appreciated it and it's really bearing fruit for us today. Long before Omen, Aska took me around the world and back and opened all manner of doors in my life and continues to be a solid, creative force today. After we released Absolute Power, Omen was one of three offers I received to join and sing for other very well respected and established metal bands. Of course, any outside endeavour on my part would always be in addition to Aska and not in place of it. On YouTube it's possible to see videos with Aska and Dimebag Darrell jamming together some nice covers of Priest, Metallica, etc etc. How important was Dime for you? A nice change of direction in your sound starts with Nine Tongues. What happened in that period? Well... I think what happened is that I started wising up. I could see which songs were working for me, for my voice, and I started concentrating my writing in that direction. No disrespect to any of the guys intended, but you can clearly listen to the difference in my songs versus some of what the other guys were writing. Then when the reviews came out for Nine Tongues, it really confirmed what I'd been thinking all along, which was, the multi-singer, multi-directional, write what you feel, approach is cool, and I had been a strong proponent of such, but what if we just consolidated our sound, our style, our direction, picked one road and followed it through instead of veering into off roads and such - wouldn't the band be better for it? The critics seemed to think so and were quite vociferous about it. To me, I could give a damn about critics, the very word has huge negative connotations, but man, in this, I found that I agreed with the critics. And once the entire band got on board and made that leap, the results were staggering and immediate. Unfortunately, the move that put us on the map, also ultimately cost us one of our founding members, Darren Knapp, because he no longer felt validated or supported as a singer or songwriter. I told him to dissolve himself of this nonsensical thinking but ego's and insecurities are ever what they will be and such is life. I don't make the rules, I just live within their boundaries and break as many as I can get away with. Not all the people know that Aska play for the US army in their bases.... Explain this 'strange' experience! Back in 1992 after a club show in Dallas, we were approached by an active duty military officer, he was a major in the U.S. Marines, and he asked us then, if we'd consider doing a tour of U.S. Military installations in Saudi Arabia and the other locations throughout the Middle East. This was right around the time of the first U.S. ground war out there, Desert Storm, Desert Shield. It wasn't peril free out there, but we jumped at the chance. Our thoughts were like, "Man, if we can do this, we can do anything!" So we went, did it, survived it and got asked to go back three months later to entertain the soldiers at Christmas time. Aside from the fact that military men and women are trained in combat and such, these guys aren't any different from anybody else. They're far from home in foreign lands and climes and the response to us was always so overwhelmingly positive that we just found ourselves wanting to go out again and again to play for the troops though it did have some scary moments and serious elements of risk involved. While in Dahran, Saudi Arabia we were lodged in the Khobar Towers. They don't exist anymore. Those were the towers that were truck bombed a few years later. I think 26 people died when those came down. It hardly registered with people here in America, but because I stayed, slept and was awakened in those buildings at 5 am every morning to Muslim morning prayer call for weeks at a time, it was quite impacting. Oh it was. I remember playing an outdoor show in Riyahd at a place called Eskan Park. Some days later a car bomb went off there that killed like 5 people or so. It was crazy, but the flip side of that is that we were happy to play there. We made so many new friends and fans from this and we still keep in touch with many of the people we met on those tours. We also kept getting invited back. We toured global military bases, camps, installations, facilities, embassies, you name it, for a solid 8 years. And we went to every frickin' hotspot you can think of. We went to the Balkans during the whole Bosnian/Serbian war. We had to travel cross country with flak jackets and kevlar helmets on. I remember stopping for hours while crews scanned the roads for land mines and such. And at a big outdoor fest in Croatia I remember automatic fire sounding off in the distance while we played in the bitter cold with these industrial heaters blowing onstage to keep us warm. The heaters were great, but the moment we'd walk in front of them our guitars would go horribly out of tune. I wouldn't trade any of it for the world though and you know why Umberto? I can only imagine that some of the troops we entertained and rocked with aren't with us anymore. It's a bothersome thought that people died maybe days, weeks, or months after seeing us yet it's at least somewhat comforting to know that during these international conflicts we, as Aska and as individual people, were able to bring a few moments of respite, escapism, rock n roll and fun to these young men and women's lives. There's no price you can put on that. Avenger and Absolute Power show to the masses the classic metal side of Aska and these are the first albums published worldwide. How was the audience answer? Through the roof brother. Metal fans have embraced these records with open arms and we are thoroughly grateful to have created such interest and instilled such fervor in the converted. Our intent is to continue doing what we do without regard for trends, trappings of the day or any of that other buggery. Tell something personal to end this interview and thanx once again for your time. I can't wait to see all of you guys, when I get back to Europe this year and next. 2010 is shaping up to be a big year for both Omen and Aska with new records coming out for both bands, appearances across both the US and Europe at Sword Brothers, Headbanger's Open Air, Pathfinder Metal Fest, Warriors of Metal III, Rocklahoma IV and and many more. We'll also be going to places like Norway and such for the first time ever and maybe a return to Poland. I hope to catch as many of you as possible at these shows. And in closing I'd like to say that if you don't have Absolute Power in your collection yet, you can get it right now by going to our websites and clicking the 'Buy It Now' buttons where they appear or just go to your favorite retailer online or otherwise and ask for it. We're at www.askaband.com and at www.myspace.com/askaband and at www.myspace.com/omenofficial and I'm on facebook under George Call. Thanks so much for the interview Umberto, Ice Vajal, and all of you my brothers and sisters of metal. I look forward to seeing you all soon. Hail! Sounds like next year we will hear and see a lot of George Call and 'his' bands! Watch out for more news from Aska and Omen!